This template for improving consistency in ROI and TCO calculations is one I build for my company. Feel free to download, use it, and share your experience. One of the most critical, and yet annoyingly abstract excercises in IT, is to make consistent and mutually acceptable evaluations of costs and benefits. There are so many factors and assumptions involved that it can become almost impossible to get a mutual understanding, and you’ll find yourself stuck in Sisyphusian meeting-cycles with overly technical terms and disbelieving eye-rolls fighting for airspace while business value is quietly climbing out the window. The overall problem is that in most cases nobody really knows for sure, and if you’re not careful you end up with strong-arming as general design principle, where business will quote gazillion Euro potential benefits in additional sales and IT will refer to obscure security policies to force their will instead of identifying the simple solutions that could really steal away some market-shares from the competition. This is why a common approach to creating business cases is critical to competitive IT, and why I’m sharing my template to get your input on how it works for you and hopefully some good suggestions on how I could improve it. High complexity: Even if you had a perfect template to work from, this is one of the most complex areas of IT, and one that depend on evaluating validity of input from pretty much all IT and business disciplines, so if you don’t have a solid understanding across fields, you’d probably be better off with guesstimating. Overlapping terminology: This template is for practical work. I am not a financial theorist and I know that there are a number of others ways to approach this, but in my experience consistency in communication is far more critical than what theory you adhere to, so feel free to replace my terms with whatever rocks your boat. 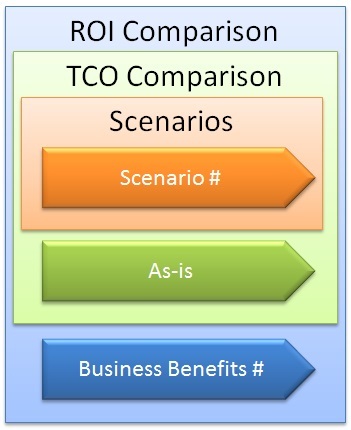 Basic understanding required: This template will not teach you how to do TCO or ROI. It is a practical tool for those of you already working in this area and wanting more consistency in your approach. In summary, I don’t take responsibility for anything you do with this tool or any outcomes you get from it. There is no golden goose or perfect tool that will do this for you. You have to rely on your own skill and experience to give you the answers you are looking for, and you have to establish your own good working relationship between IT and business to really get the benefits of all the amazing technology out there.